Dun Magazine: Kara Armano as the marketing genius behind Sage, Redington, Rio Products, and Loon. She is also one of the founders of Artemis. Photo courtesy of Andrew Miller. RIO Products is a difficult company to ignore, dislike, or criticize for lack of ingenuity and product development. It’s been that way since I met Jim and Kitty Vincent in the summer of 1991 in Ketchum, Idaho while fishing Silver Creek. They had just started the company. My perspective is from a fly fishers point-of-view with no other industry attachments except being a humble scribe and working for an editor/owner/publisher who is a professional guide, Capt. Andrew Derr. 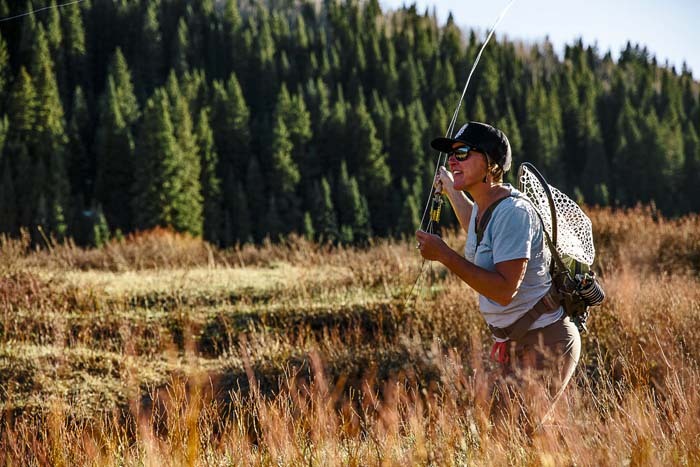 I am not privy to RIO’s current business model – distribution and retailer service, but I doubt it’s problematic since RIO is everywhere and pretty much the “line” of choice industry-wide, and I’ve never known of a fly shop owner discontinuing the line. As an angler recently off a 25-year long salt addiction and back in the trout, panfish, inland striper, and basses business, I’ve wrestled with indicators – loving and hating them exactly where I left off. When yet another indicator option arrived in my E-news box a few weeks ago, I was ready. As many will agree, indicator breakthroughs have been breaking thru at a steady pace since I began to fly fish. Each new indicator never surviving its inherent bedevilment; taking too long to assemble or disassemble, made too big a “splash,” had too short a “use by” stamp, tended to get water-logged, could not be reset at a different point of the leader without a redo, barely indicating anything, or required a complete redo with each new usage – cumbersome. 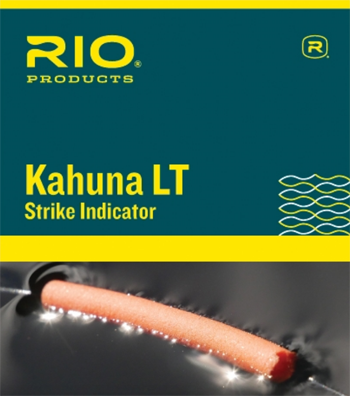 RIO’s Kahuna LT (love that name) – ‘Kahuna’ was a childhood slang word we used for folks that overate too often. Opening the packaging and seeing the homeboy bobbin threader and stripping the coating off to expose the core reminded me of assembling a hollow-core wind-on fishing leader. The threader, of course, can be any thin, stiff wire. So, slip the leader into the hollow indicator “tube” and . . . Nothing. You’re finished rigging – slide it up or down to where you want it on the leader, and reposition as needed. No. It will not slip. It comes in two diameters with four to a pack + “threader” (thick, .025”; thin, .095”) – $10. Enough to last at least two seasons for most folks.